Simulations become much simpler at the end of the second week of the finals since there are just 3 games left to consider. The table on the left provides the MARS Rating-derived probabilities for each of the six possible contests we could witness over the remainder of the season. In next weeks' games, the Cats are firm favourites to defeat the Eagles according to the MARS-based assessments. With an 84% probability, a price of around $1.15 should be expected assuming a 6% overround. The Pies are only slightly less firm favourites, being rated 77% chances against the Hawks, and should be expected to open at about $1.25 if the TAB Sportsbet bookmaker concurs with our assessment of their chances. Assuming the Pies and the Cats both win, then I'm currently pricing the GF at about $1.60/$2.25. All eight of these scenarios, along with the scenario based purely on the MARS-based projections, are summarised in this last table. 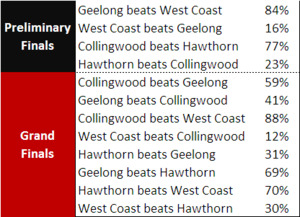 The first column, which is based on the probabilities provided above, has Collingwood as slightly less than even-money favourites for the Flag, Geelong as about 6/4 chances, the Hawks as 10/1 propositions, and the Eagles as about 32/1 chances. With these probabilities and current prices, no team represents value on the TAB at present. Turning next to GF Quinellas, a Pies v Cats matchup is about 2/1 on, a Pies v Eagles pairing about 7/1, a Hawks v Cats pairing about 4/1, and a Hawks v Eagles pairing about 24/1. Amongst those, only the Pies v Cats quinella, currently at $1.59, represents value as it has for a few weeks now, though the edge is only small. Collingwood's flag chances suffer most if their own chances have been systematically over-estimated by 10 percentage points for each of the opponents they might meet. That knocks 13 percentage points off their chances. Almost as damaging to the Pies' chances is if the Cats' chances have been underestimated: a 10% point stronger Cats reduces the Pies' flag chances by 9 percentage points. Geelong's flag chances drop by 12 percentage points if their own chances have been over-estimated by 10 percentage points, and by 10 percentage points if Collingwood's chances have been under-estimated by the same amount. Hawthorn's chances drop 8 percentage points if their own chances have been over-estimated by 10 percentage points, by 4 percentage points if Collingwood's chances have been under-estimated by 10 percentage points, and by 3 percentage points if the Cats have been similarly under-estimated. West Coast's chances drop 3 percentage points if their own chances have been over-estimated by 10 percentage points - about the only 3 percentage points they had to begin with. Under-estimations of the strengths of Collingwood or Geelong have only slightly less impact, leaving the Eagles with only about a 1-in-100 chance of winning the Flag. A Hawthorn v West Coast GF is most likely with a weaker Geelong or a stronger West Coast.